In a case in Wichita, Kansas which has garnered national attention, Dr. Stephen Schneider and his wife, Linda, the local doctor-and-nurse team are accused of running a large-scale "pill mill" and dispensing prescriptions that led to the drug-related deaths of 68 patients. Prosecutors allege that the Schneiders illegally prescribed large amounts of powerful painkillers for profit, with little regard for patients' safety. The defense, along with some former patients, argue the Schneiders provided sound and compassionate care, and that the deaths were due to underlying conditions or dangerous choices by addicted patients. The couple's trial, which has been ongoing since April, has once again shed light on the increasingly sensitive issue of prescribing high doses of opioid medications for pain. Opioids (drugs such as fentanyl, oxycodone and hydrocodone, which the Schneiders prescribed), which are crucial for the welfare of pain patients, especially at the end of life, are unfortunately better recognized as addictive drugs associated with overdose death. (See Ledger, Heath.) And although the popular perception of these substances is in many ways misguided, cases like the Schneiders' highlight the dangers of prescription-drug misuse. But the case has also highlighted the difficulty of accurately determining if a cause of death is indeed a drug overdose. 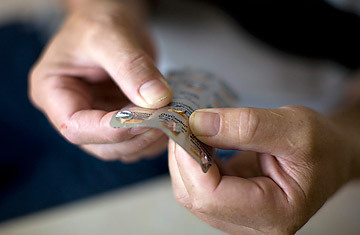 With the rate of prescription-drug-related overdose deaths more than tripling in the U.S. since 1999, according to the Centers for Disease Control and Prevention  and with physicians sometimes being prosecuted for contributing to these deaths  it is the courts, not physicians, that are increasingly forced to make judgments about drug-users' real cause of death. Unfortunately, the mechanics of that determination are poorly understood  sometimes even by the toxicologists, pathologists and medical examiners who make the call. Circumstances of death surrounding drug use are also often difficult to untangle: In the Schneider case, virtually all the patients who died were found to have multiple drugs in their bloodstream, often including illegal drugs; in addition, many of the patients were known sufferers of chronic pain with chronic, life-threatening diseases such as heart disease and high blood pressure  conditions that can cause death on their own, without drugs. Much of what scientists do know about drug-related death comes from the 25 years of research by Dr. Steven Karch, a cardiac pathologist based in Berkeley, Calif., who has written two widely respected texts on the topic. On June 7, he testified for the defense in the Wichita case, stating that in most instances of drug overdose, the currently available medical technology cannot accurately determine whether or which drugs caused death. Several scientific factors conspire to complicate the issue: First is the widely acknowledged question of tolerance. Patients who take pain medications over the long-term will necessarily build up some amount of tolerance to the drugs. That means that a dosage of a painkilling opioid such as methadone or fentanyl that would be therapeutically appropriate for a pain patient could be enough to kill a person who has never taken them before; in a methadone patient, an extremely high dose might not even be enough to address withdrawal symptoms. In other words, Karch says, the "lethal dose" of these drugs is impossible to standardize, even for patients who are taking a single drug rather than a combination of many. A 2000 study by Karch compared methadone patients who had died from clear causes, such as car accidents, with those who had died of a suspected overdose. Karch found that there was no predictable difference in the postmortem blood levels of methadone between the two groups. In fact some of the patients who died of other causes had higher levels of methadone in their bodies than those thought to have overdosed. "You can die from a drug and you can die with a drug," says Karch. "When you have four orders of magnitude separating either end of the curve, many of these deaths may not have to do with drugs at all." At least one forensic tool helps clarify the question in some cases, according to Karch. In 1999, Karch testified on behalf of the prosecution in a case against a British physician who was convicted of killing 15 patients by injecting them with heroin (a legal painkiller in the U.K.) and is suspected of having killed hundreds of others. By analyzing hair samples, which can record an individual's history of drug use, Karch was able to show that the patients were not prior drug users and were, therefore, almost certainly killed by the drugs the doctor administered. This technology, which can cost thousands of dollars per analysis, was not used in the Schneider case, during which the medical examiner testified that a person's drug history is "not something that I usually consider or go into" when drugs are detected in the body and no other cause of death is apparent. A second complication in cause-of-death findings is what medical examiners call "postmortem redistribution," the shift in detectable drug levels that occurs after a person dies, according to Fred Apple, medical director of clinical laboratories for the Hennepin County Medical Center in Minnesota. Many drugs that may be contained in fatty tissue in a living body are released into bodily fluids after death, which confuses the analysis of substance samples taken postmortem. In a study published in March in the American Journal of Clinical Pathology, Apple and colleagues measured fentanyl levels in bodies immediately after death and again several hours later at autopsy. The researchers found that some bodies had no detectable levels of the drug at the first measurement but showed significant levels at the second  and that these levels varied widely depending on which part of the body was sampled. Since it is not always clear when exactly a person died, or how long redistribution takes, the variance could make a therapeutic level of a drug appear toxic, or vice versa. What is clear, however, is that juries across the country are in some cases hearing evidence based on shaky forensic science or from forensics professionals who lack the necessary expertise. According to a 2009 report by the National Research Council of the National Academy of Sciences: "Rigorous and mandatory certification programs for forensic scientists are currently lacking...as are strong standards and protocols for analyzing and reporting on evidence. And there is a dearth of peer-reviewed, published studies establishing the scientific bases and reliability of many forensic methods. Moreover, many forensic science labs are underfunded, understaffed, and have no effective oversight." Given the state of the science, then, should it be used in court? Ed Cheng, a professor of law at Brooklyn Law School and expert on scientific testimony, says, yes, noting that more research is still needed. "If we were to require studies and statistical assessment on every assertion, almost nothing would be able to be used in court. My view on this is that the question here is not throwing the baby out with the bathwater," says Cheng. "It's clear that the forensic sciences do not have as much of an empirical basis as we would like them to have. The question becomes how do we motivate them sufficiently to come up with the empirical basis that we want?" Some experts do agree with Cheng. "The evidence base is improving," says Apple, who is currently conducting a study of blood and tissue samples taken postmortem, in order to build up a usable database of drug information. "So when people have to make death determinations from smaller jurisdictions where they don't have [an expert on staff] like me, they can make them with some assurance." But Karch is less sanguine about the reliability of such data and thinks that as long as the reliability of forensic evidence is still evolving, it has no place in court. "It's a giant miscarriage of justice," he says. He recalls the malpractice and murder convictions that were won many years ago against doctors who were thought to have killed patients by administering digoxin, a drug for arrhythmia and other heart problems. It turned out that the drug collected in the heart muscle in live patients and was released into the body after death, making safe doses of the drug look deceptively high  a result similar to those seen in current studies of fentanyl and methadone. In the Schneider case, which entered jury deliberations on Wednesday, the defense team sought and failed to prevent the jury from hearing testimony that it believed did not have sufficient scientific foundations. But according to Cheng, it may be preferable to let the jury hear both sides of the scientific dispute and make up their own minds. "I myself have floated between the poles on this," he says. "I'm currently more on the 'Let the jury hear it' side. I'm not convinced that good science and bad science is always cut and dried."